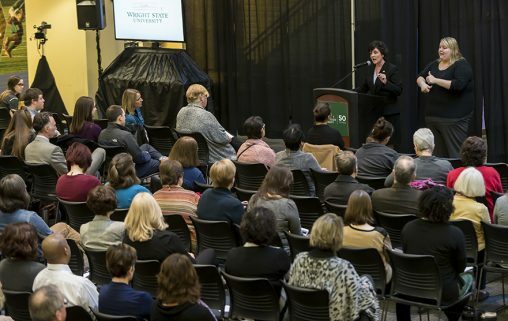 Wright State presidential candidate Deborah Ford says she is attracted to the university because of the diversity of its students and its mission to transform their lives and the communities it serves. And she says academics must be maintained as a priority. Ford is one of three finalists for the Wright State president’s job. The other candidates are Dennis Shields, chancellor of the University of Wisconsin-Platteville; and Cheryl Schrader, chancellor of Missouri University of Science and Technology. Ford met with students, faculty, staff, administrators and community leaders Feb. 6–7 in forums at the Dayton and Lake campuses. She said she has a passion for higher education and student success. Her goal is to create the best possible learning environment that extends into the community and region. She described her leadership style as collaborative, team-building and engaging, with a focus on excellence and accountability. She said she sets a high bar for herself and those around her — that staff plays a critical role in the success of a university — and that integrity and trust are critically important. The University of Wisconsin-Parkside is a four-year public university in southeast Wisconsin. Part of the University of Wisconsin System, the school has about 4,500 students and 125 full-time faculty. It offers 33 undergraduate majors and three master’s degrees in 22 academic departments. About 58 percent of the students are first-generation college students. During Ford’s tenure as president, the percentage of minorities in the student population has increased from 26 percent to 31 percent. In its vision statement, the school is described as a dynamic learning community grounded in academic excellence and focused on student success, diversity, inclusion and community engagement. Ford said public universities are facing declining enrollments and financial support from state government and that university officials must work together to make a case for the value of higher education. She said there is an opportunity to grow enrollment at Wright State, particularly by focusing on adult learners with some college experience but no degree. Ford said she has experience in dealing with budget challenges and believes in facing “brutal facts” without becoming discouraged. Since 2010, the workforce at Wisconsin-Parkside has declined by 12 percent. “We are very lean in our administration and faculty ranks,” she said. While she does not believe that Wright State’s financial situation is dire, Ford said it may be necessary to contract some things. However, she does not believe in across-the-board actions and believes in minimally impacting faculty’s ability to teach and conduct research. Deborah Ford met with students, faculty, staff, administrators and community leaders in five forums at the Dayton and Lake campuses. Ford said the core of a university is its academic enterprise, which is essential in maintaining a quality learning environment. “So we have to keep that as a priority,” she said. Ford acknowledged that faculty workloads at Wisconsin-Parkside have increased. She said she has limited experience in dealing with faculty labor unions, but would hope to have collegial conversations and agree to do what’s best for the university. Ford grew up in Louisville, the oldest of three daughters, all of whom have careers in education. She was a first-generation college student, obtaining her bachelor’s degree in counseling and guidance from the University of Louisville, master’s of education in college student personnel from Indiana University and her Ed.D. in educational administration from the University of Louisville. She served as vice president of student affairs and professor at the University of West Florida and vice president for student affairs, dean of students, associate professor and coordinator for student development at Spalding University, a private school in Louisville. She joined Wisconsin-Parkside as chancellor in 2009. 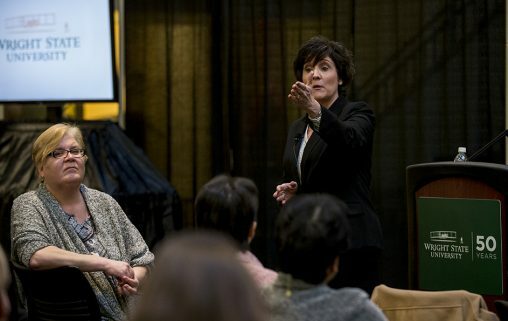 Ford said she believes in maintaining affordability and accessibility at Wright State. She favors more job opportunities for students on campus and robust support services for nontraditional students. She said living on campus can help students learn about themselves, how to adapt and develop leadership skills. But she said commuter students also need support services and should be made to feel like they have “a living room on campus.” She favors the library as a central hub as well as the Student Union. Ford said universities have a responsibility to provide a forum for free speech and be open to public speakers of all perspectives. However, she said the campus needs to anticipate and prepare for any reaction to controversial speakers. Ford said athletics serves as an opportunity to recruit students and that athletes are often campus leaders and extend the reach of the university by serving as ambassadors during away games and meets. She said that while athletics is an “exciting part” of campus life, it is not the only part and needs to be integrated with other aspects of the campus environment. Ford said the liberal arts and social sciences provide a core foundation for team-building, critical thinking and communication skills. And she said she is a supporter of international education, including study-abroad programs and curriculum that increases students’ knowledge of global issues. She also said research is an important part of the university experience and that research institutes such as the one at Wright State create the opportunity to attract more research funding. She said the university is well-positioned to maximize research opportunities in the defense and medical fields. “Research and innovation are part of the DNA of campus,” she said. Ford also said Wright State offers an array of academic programs that align with the needs of local businesses and is in position to expand on that. “I believe our role is to be a talent-development provider,” she said. Fundraising is also a key responsibility of a university president, Ford said. She helped secure one of the largest gifts in Wisconsin-Parkside’s history during her tenure as chancellor — $3.5 million to support the operations of an arts center and related scholarships. More information about Ford — including her CV, letter of interest and links to videos of her forums — is available on the university’s presidential search website.